Most seniors and elderly enjoy playing games. All kinds of games: cards games, board games, puzzles and more. But, as we age, life takes a toll on our vision (among other things!). Low vision, cataracts, glaucoma and more affect our vision later in life. There is no reason though for seniors to stop playing the games and activities that they love. Many of the most popular games are available in bigger, easier to read formats. Here is a list of large print games for elderly that you may not have known existed! There are benefits to playing games for elderly other than just having fun. Keeping seniors busy is important to their overall health. There are specific health and socialization benefits to gameplay. Brain Stimulation. It is very important to keep the elderly stimulated and active – physically and mentally. Games keep the senior thinking and concentrating which keeps their synapses firing. These activities also keep them learning and engaged with the world around them. Stress Relief. Many seniors don’t show it, but they are stressed out. Think about it: they are dealing with managing medications. Maybe they have had to move from a home they loved. Maybe they are facing life without a spouse. They are also thinking about their own mortality. Playing a game can relieve some of this stress, bring a smile to the face, and some joy to a stressful life. Develops and Improve Relationships. Let’s face it: many elderly people feel alone. What was once an active life has now been reduced to a lot of sitting and Sunday afternoon visits – if they are lucky. Playing games, though, creates an opportunity to meet new people. Relationships can grow with family and friends too through gameplay. Why do you think Bingo is so popular with the elderly community? Improved Immune System and Health. Studies have proven that mood and mental health have an impact on the immune system and overall health. Happier people are typically healthier than someone who is depressed. Keeping the elderly brain stimulated, reducing stress, and having healthy relationships all lead to a better mood for seniors. It just makes sense this will lead to better health overall. Seniors and elderly love playing card games. I have fond memories of my grandmother playing solitaire on the coffee table. She also loves to tell stories of playing canasta with friends. Bridge and rummy are also favorite card games among seniors. It is important to keep the elderly involved in these activities that they love. Even if their sight diminishes, they can keep on playing with large print cards for seniors. These cards are easier to see with large print letters and suit symbols. Hey, and using these makes it easier to cheat, right? Kidding of course! While we are talking about card games, another popular card game for the young and old alike is Uno. Seniors and younger family members can play this game together for multi-generational bonding and relationship building. 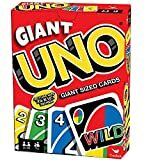 Large print Uno cards are available in a giant card version of the game. 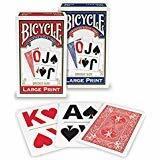 Imagine the fun that will be had with cards that are 7-1/2″ wide by 10-1/2″ tall – nearly the same size as a sheet of paper. Kids will love playing with these cards too. Of course, the larger print game cards are much easier for the elderly to see too. Scrabble is another popular game among the elderly and seniors. It is also a great game to keep them mentally sharp. Problem is that the tiles can be hard to read. The standard Scrabble tiles are dark print on a brown wood background. Using large print scrabble tiles on a white background is a much better option for seniors with vision problems. If the elderly person already has a Scrabble board, you can buy a pack of large print Scrabble tiles separately. If not, I recommend buying the full Deluxe Giant Scrabble Game. The entire game board is 50% larger than a standard Scrabble board including larger letter tiles. The board has slots that keep the letter tiles in place plus a turntable too. That way, the players can rotate the board to the next player without worrying about tiles moving. This will also benefit seniors who may have tremors because the tiles won’t move once in place. 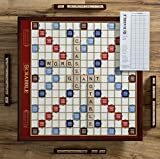 Game board and all components are 50 percent larger than standard Scrabble - Game Board Measures 25" x 25" x 2.75"
Checkers is a great game for the elderly because it requires motion as well as brain power. Then senior practices hand-eye coordination and processes strategy and logic. Getting a jumbo-sized game set will allow them to see the board and pieces better. They will be able to handle the larger piece too. Amazon offers an inexpensive jumbo checkers set with a 28″ x 28″ game board that is actually a rug that rolls up. The playing piece are 3″ in diameter too – much larger than the standard checker set. Because it is larger, the senior can play with smaller children without worry of swallowing the game pieces. Chess is known as the world’s most strategic game. It requires thought, concentration, and strategy. Also, like checkers, it requires hand-eye coordination to set the pieces in the right places. Without controlled hand movements, pieces could be knocked down. It’s good for elderly and senior to practice both mentally and physically. Standard chess sets come with small boards but the real difficulty for many elderly people are the playing pieces. As eyesight fades, the pieces can be hard to distinguish from each other – especially the taller pieces. And when playing chess, you sure don’t want to get your king and your queen mixed up. That’s why I like this large chess set. It is 22″ x 22: with pieces that are up to 4.5″ tall. But even better than the size, the pieces are highly detailed and easy to see. The elderly player will love this! 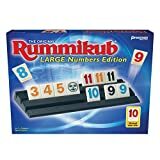 Have you ever heard of Rummikub (pronounced rummy-cube)? It is a rummy style game except that it is played with tiles instead of with cards. The object of the game is the same. Get rid of all your tiles by getting runs or groups. You can also play on other player’s groupings. Here are the official rules for how to play Rummikub if you’d like to know more. Like some of the other games I have reviewed, the problem with Rummikub in the past has been the print size of the tiles. But now there is a large print version of the game for elderly and seniors. The writing on the tiles is larger and brighter. Plus orange color set was replaced with bright green for more visual contrast. All of this makes it easier for the player to see their own tiles as well as the tiles played by others. Dominoes are a traditional game that many elderly people grew up playing. The mexican train version of the game is probably the most popular version. The object of the game is to rid your hand of as many dominoes as possible while sticking your opponents with as many as possible! Here are the full rules for mexican train if you’d like to read more. Playing this game will keep the elderly both mentally and physically moving. The game requires strategy and also basic math – score sheets are kept at the end of each round. Mexican train is also good for hand-eye coordination to line up the dominoes in the proper spot. 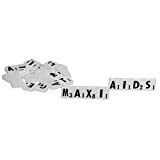 This version of mexican train dominoes uses large bright numbers on a white background. No small dots to count like regular dominoes. The tiles are also over-sized and easier to handle. It is also another family style game that can be played by multiple generations. What are your favorite large print games for elderly people? Do you have a favorite that I have missed? Is there another game that is easier for seniors to play that you can recommend to my readers? Leave a comment below!